Located in the heart of Inglewood, less than one mile from the iconic Fabulous Forum and the future Rams/Chargers football stadium. Our creative boutique space is a blank canvas that offers a luxury feel and is perfect for your gathering. The possibilities are endless. Our space can be used for Anniversaries, Art Exhibit/Shows, Baby and Bridal Showers, Birthday Celebrations, Book Signings, CD or Product Release Parties, Church Services, Cocktail Parties, Comedy Shows, Corporate Events, Engagement Parties, Fashion Shows, Fundraising Events, Graduation Parties, Holiday Parties, Intimate Weddings & Receptions, Launch Parties, Memorial Services, Mother’s Day/Father’s Day Brunch, Networking Events, Paint and Sip Parties, Pilates Classes, Photo Shoots, Pop-Up Shop, Private Dinners, Product Showcase, Prom Parties, Rehearsal Dinners, Repasts, Seminars, Styled Shoots, Training, Vision Board Workshops, Wine Tasting, Workshops, Yoga Classes. 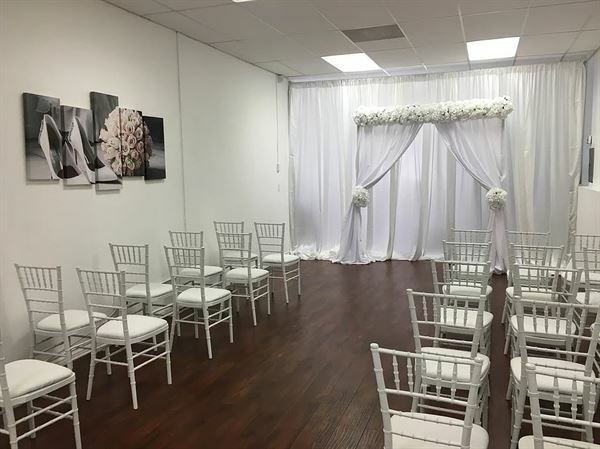 All rentals include white plastic folding chairs, tables and white tablecloths We have other furnishings and linen colors to rent or you may use your preferred vendor. When using an outside vendor rentals must be removed/picked up by the end of your event. You receive 30 minutes to set up and 30 minutes to breakdown, if you require additional time there is a set up/breakdown fee of one half the hourly rate for up to 3 hours. Anything over 3 hours regular rates apply. Renter must provide special event liability insurance to protect you of any damages resulting from your event. Host Liquor Liability Coverage is required if alcohol is being served. If you are a business owner your insurance may cover your event, please consult with your insurance company prior to booking. Accommodates up to 40 people (depending on layout) Perfect for photo shoots, client meetings, workshops, classes, intimate weddings, sip and paint, baby showers or bridal brunches. Your rental includes white plastic folding chairs, tables and white tablecloths. We also offer a variety of furnishings and linen colors that can be rented at an additional charge or you can use your preferred vendor. All outside rentals must be removed/picked up at the end of your event, we do not offer storage. Parking - 2 parking spaces are included with your rental. There is plenty of street parking and a public parking lot nearby. A private parking lot can be rented for an additional charge. We can arrange valet or shuttle service, we also encourage Uber and Lyft. Please adhere to the following rules: - Hours booked includes setup and cleanup time. - Guest must provide special event liability insurance to protect you of any damages resulting from your event. You must add Host Liquor Liability Coverage if alcohol is being served. If you have business insurance you maybe able to use it, please inquire with your insurance company. - Smoking (including e-cigarettes and vaping) is prohibited on the premises or within 25 feet of the building. - Furniture can only be moved by our staff upon request. Requests must be made at least 48 hours prior to the event. - Low tack tape is allowed on our floors and walls when decorating. No nails, screws, staples or penetrating items are to be used on our ceiling, walls, or floors. - Glitter and confetti are prohibited. - Battery operated or flame-less candles are allowed. No open flames or candles of any kind. - All outside rentals and equipment must be removed at the end of the event. We do not offer storage. - Guest is responsible for removing decorations, picking up and clearing away all trash. Trash must be placed in the bins provided, staff will take care of the rest. - Security is required for events with amplified music and/or events serving alcohol. There is an additional cost. Security pricing is $35 an hour per guard. This is on a case by case basis, please inquire prior to booking. - There is no cooking or food prepping allowed. You're welcome to have prepared or catered food delivered to the venue. - Serving alcohol is allowed, licensed/insured bartender is required. - Selling alcohol is prohibited. - Providing or serving alcohol to minors is prohibited. - Guest must provide proof of license and insurance for all vendors. - Loitering or congregating outside on the front sidewalk or in the rear is prohibited. - Conduct deemed disorderly or unsafe will result in immediate expulsion from the premises and conclusion of the rental period. In such cases no refund of the event costs shall be made. - No loud music after 12:30 am. - No pets allowed. The Meeting Room | Starts at $60.00 an hour - 2 hour minimum - $25 cleaning fee The Showroom | Starts at $100.00 an hour - 4 hour minimum - $50 cleaning fee The Suite | Starts at $125.00 an hour - 6 hour minimum - $75 cleaning fee All Rentals Include: - White plastic folding chairs - tables and white tablecloths. We have other furnishings and linen colors to rent or you may use your preferred vendor. When using an outside vendor rentals must be removed/picked up by the end of your event. We do not offer storage. Hours booked includes setup and cleanup, please budget your time accordingly. Renter must provide special event liability insurance to protect you of any damages resulting from your event. Host Liquor Liability Coverage is required if alcohol is being served. If you are a business owner your insurance may cover your event, please consult with your insurance company prior to booking. You may use whomever you choose for special event insurance or click here to go with our preferred vendor. Your event is not booked without a deposit and the venue will not be available if final payment has not been received five days prior to the event date. Non-profit (501 c3) organizations and events booked for 8+ hours may enjoy a 10% discount, restrictions apply, call for details. Prices are subject to change without notice. Are you looking for a space to have a pop-up shop, product launch or showcase, reception, to teach yoga and Pilates? The Showroom is perfect for such gatherings. The Showroom comfortably accommodates up to 75 people possibly more depending on the layout. Your rental includes white plastic folding chairs, tables and white tablecloths. We also offer a variety of furnishings and linen colors that can be rented at an additional charge or you can use your preferred vendor. All outside rentals must be removed/picked up at the end of your event, we do not offer storage. Parking - 2 parking spaces are included with your rental. There is plenty of street parking and a public parking lot nearby. A private parking lot can be rented for an additional charge. We can arrange valet or shuttle service, we also encourage Uber and Lyft. Located in the heart of Inglewood, less than one mile from the iconic Fabulous Forum and the future Rams/Chargers football stadium. Our creative boutique space is a blank canvas that offers a luxury feel and is perfect for your gathering. The possibilities are endless. Rental includes both rooms and can accommodate up to 100 people. The space is perfect for networking events, seminars, birthday celebrations, comedy shows, church services...the possibilities are endless with the space. Your rental includes white plastic folding chairs, tables and white tablecloths. We also offer a variety of other furnishings and linen colors that can be rented at an additional charge. You're free to use your preferred vendor for rental, please keep in mind when using an outside vendor your items MUST be picked up at the conclusion of your event. We do not offer storage. Our space boost two rooms that will accommodate up to 100 people comfortably depending on your event's layout. We have staff on-site to support your event for the time you have booked the space. Please budget your time accordingly as your rental includes load-in/setup and strike/breakdown. If you believe you'll need extra time please notify as soon as possible (preferably before the day of your event as there may be another event scheduled before/afterwards). Parking - 2 parking spaces are included with your rental. There is plenty of street parking and a public parking lot nearby. A private parking lot can be rented for an additional charge. We can arrange valet or shuttle service. We also encourage Uber and Lyft.